9x12, xv + 179 pp. The violinist and composer Johann Schop (ca. 1590–1667) was closely associated with the city of Hamburg's musical life in the seventeenth century. As director of Hamburg’s civic music ensemble, the Ratsmusik, he was expected to provide an instrumental repertoire that could fulfill a variety of functions in the social life of the town, such as public ceremonies and weddings. 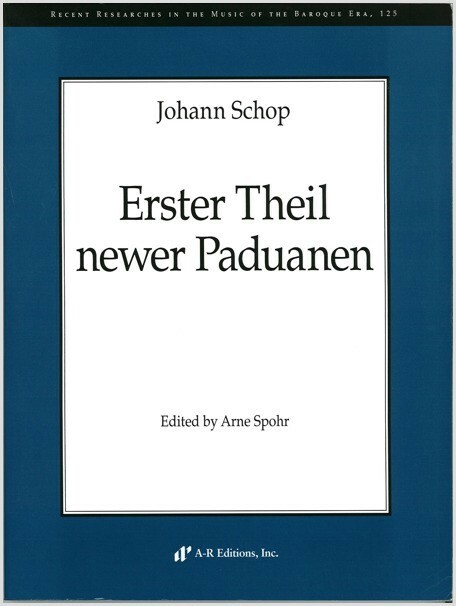 His collection Erster Theil Newer Paduanen, Galliarden . . . (Hamburg, 1633/1640) is a good example of this repertoire, typical of civic musical culture in Hamburg and other North German towns at that time. Of all the collections of instrumental ensemble music published in Germany during the first half of the seventeenth century it is one of the most substantial. It comprises a great variety of genres, scorings, and styles (conservative and progressive) and documents an important stage in the development of a seventeenth-century German instrumental ensemble idiom. Michael Robertson. Early Music, Feb. 2007.